There is an Aleratec hard disk drive duplicator to meet your hard disk duplication needs, whether you need to make one hard disk copy or many. 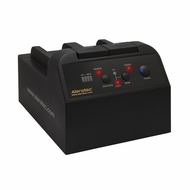 The Aleratec line of standalone duplicators include duplicators which are also hard disk sanitizers and hard disk docks. 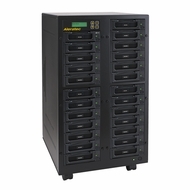 Aleratec hard drive duplicators execute perfect clones of up to 24 IDE or SATA hard disk drives, and save businesses, organizations and government agencies valuable time and resources. In addition to high-speed duplication, our Industrial hard disk drive duplicators incorporate advanced hard drive sanitization features to ensure that all traces of information on the drives are completely erased and forensically unrecoverable. With transfer rates up to 120 MB/s (SATA), Aleratec’s industrial line of high-speed, stand-alone Copy Cruiser duplicators support 2.5” and 3.5" SATA drives, SSDs and 3.5” IDE HDDs. Add one of our optional adapters for duplication of mSATA SSD, CF Cards, CFast Cards, or 2.5" IDE HDDS. For organizations that require precise record keeping of highly sensitive projects, Aleratec’s Copy Cruiser WL line features computer-connected real-time progress monitoring and logging. Durable hard disk drive bays on all our duplicators allow users to load and unload hard drives in seconds, and select models include specially designed non-scratch SATA connectors rated to last more than 50,000 swap cycles. Larger tower models include front-locking dual casters to move the HDD duplicator from location to location, and Aleratec also offers economically-priced small office HDD duplicators that are both portable and powerful.